Dental Crowns are fixtures (or caps) that are used to restore the damaged visible parts of the tooth. It is one of the methods used for restoring damaged or missing teeth. Dental crowns are usually made out of zirconium or porcelain that is fused to metal (PFM). Book a Free Consultation for Dental Crowns Today! Find out prices for dental crowns at our clinics by clicking here! 1. During your first visit at our clinics, our dental experts will take an X-ray of the tooth that requires Dental Crown treatment. In some cases, Root Canal Treatment could be required before dental crown treatment can be performed. 2. 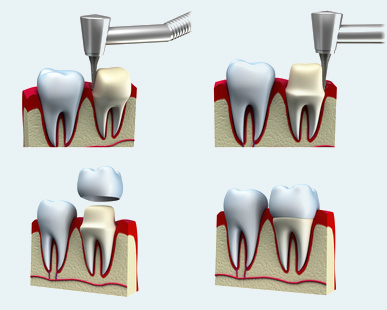 Dental Crown procedure begins by anaesthetising the gum tissues surrounding the tooth that requires treatment. The tooth is then filed along the sides and the surfaces to create a proper shape for the placement of the dental crown. 3. As soon as the tooth has been reshaped, our dentists will take an impression of the tooth. This impression will then be sent to our dental laboratory where within 2 weeks a dental crown will be created just for you. A temporary crown will be provided to protect the filed tooth and to cover the visible gaps, while our experts create your dental crown. 4. At your next visit at our clinics you will receive a permanent crown. Our dentists will remove the temporary crown and fit the permanent one. If the crown fits well, matches the shape and colour of the other teeth, it will then be cemented. What About Dental Crown After Care? Teeth that have dental crowns usually do not require additional dental care, however, dental crowns do not completely provide protection to the underlying teeth. Bad oral hygiene can cause infections and gum diseases, therefore, brushing and flossing regularly is essential.